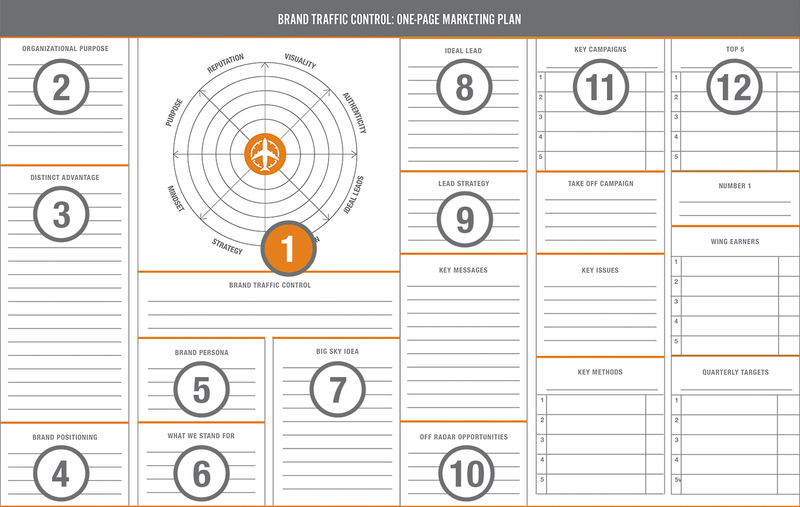 The Plan begins with Section 1, Brand Traffic Control assessment and radar tracking. Philosopher, George Santayana, said, “Those who are unaware of history are destined to repeat it.” At TwinEngine, we use a version of that philosophy as our starting point: you can’t know where you are going until you know where you are. Do we know and live our purpose as an organization? Do we know what is being said about our brand online? What is our number 1 strategic business goal? How would you describe our organization’s personality? What are our value propositions? Who is our ideal lead? What is our most effective form of marketing? Do our marketing efforts support our business strategy? Each person taking the assessment will rate the current position of the company on a scale of 0 to 5, with 0 indicating non-existent and 5 as the highest level. Plot the group’s answers on the radar to assess the degree to which a fundamental is being practiced. The results of the survey will indicate which tools may be useful in further defining and strengthening areas showing misalignment. To download The One-Page Marketing PlanTM, click here.